Payments by check is a great way of giving your guests a non-electronic way of paying for their booking while still using the public quote acceptance forms. Previously, if a guest wanted to pay by check, you had to create a manual booking and enter manual payments. You had to tell them where to send the check and hold their hand throughout the process. Now, OwnerRez will do all that for you. Open up your payment methods in your account area. Click the 'Add Payment Method' button and then click 'Add Check'. You're presented with a number of fields that are all (hopefully) self-explanatory. These fields are the information the guest will see during the quote acceptance process - information that tells them who to make the check out to, what address to send it to, additional instructions and how long you'll wait to receive the payment before the booking is canceled. What are the Acceptance Rules? Below the basic information fields at the top, you'll notice an 'Acceptance Rules' section with some checkboxes. If the guest's check payment never shows up in the mail, how long are you willing to wait before canceling their booking? Obviously, you're not going to wait forever. OwnerRez will watch your pending bookings and automatically cancel them if a payment isn't entered by the number of days you specify. By default, the form will pre-fill the number of days to 14 since two weeks is a decent amount of time for a check to be sent in the mail and then deposited into your bank account. If 14 days is too long or too short for your management preferences, simply change it to something different. How close to the arrival date are you willing to accept a check payment? If a guest inquires about an upcoming weekend, only four or five days ahead, obviously you don't want them sending a check payment because it wouldn't arrive, and clear with your bank, in time. You would want to insist that they use a credit card. OwnerRez can do this too. By specifying the minimum number of days allowed before arrival, the 'pay by check' option is removed from their quote and they have to use a credit card to accept it. By default, the form will pre-fill the number of days to 45 since a month and a half is ample time for you to rebook the dates if the guest's payment falls through. Don't accept our opinion though - change it to whatever you want! Below the 'Other Instructions' field, you'll notice a 'Use On Properties' section and your list of properties will be showing. 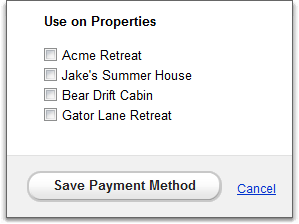 This allows you to specify which of your properties you want this specific check payment method to be used on. By default, the form will pre-select all properties that do not have a check payment method already associated with them. Most of the time, this is what you'll want since payments for all properties go to the same place and involve the same instructions. However, some owners have different corporations set up for different properties so this allows those owners to tailor specific instructions for each property. As with credit card payment methods, each of your properties is limited to having one check payment method. If your property already has a check payment method in place and you include it on a new check payment method, the new one will replace the old one. This is a hard and fast requirement of the system so as to avoid confusion when the guest is paying. We don't want to show the guest two or three different sets of check instructions on one quote. In a previous post, I showed some pictures of how the quote acceptance process changes when multiple payment methods (credit card, check, etc.) are available. If the guest chooses to pay by check, and finishes the quote acceptance process, the subsequent booking workflow changes to accommodate their lack of payment. First, the success message in the quote acceptance process once again reminds them to send their check immediately and provides another copy of your address and instructions. Then, the confirmation email they receive contains a bright red warning that their booking is pending and payment must be received or it will be canceled. 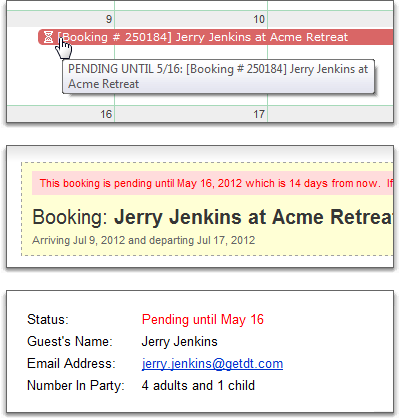 The booking shows up as 'pending' in the system, everywhere you see it, so that bookings without payment always stand out. Each day, OwnerRez automatically checks each pending booking to see if it is past its due date. Along the way, it sends occasional reminders to both you and the guest so no one forgets. The reminders are sent once every five days, from the moment the booking was created, and on the day before it is due. Finally, if the booking is still pending after the due date has passed, OwnerRez automatically cancels the booking and sends an email to both you and the guest with an explanation. What if the guest's payment arrives after their booking is canceled?! If the guest sends a check payment but is a few days late, and you still want to book them, no need to worry. It's very simple. 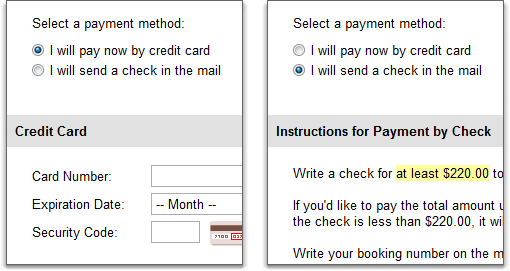 Either create a new booking and enter their payment manually, or send them a new quote to accept. If you send them a new quote, after they've accepted it, you'll enter their check payment at that point. Currently, our system does not remind the guest about their second payment if they pay by check. This is because OwnerRez monitors and collects Scheduled Payments which are all credit card based. You cannot create a Scheduled Payment for checks - there would be nothing for the system to collect. In the near future, we'll be releasing a new Scheduled Reminders feature that will allow you to send out reminder emails at various intervals as well as an overhaul of our 'second payment' payment form. Once this is released, the system will automatically schedule reminders for guests who pay by check. For the time being, please watch your bookings that are check based and make sure to collect the second payment and security deposit. We've only barely begun the overhaul of our payment methods, payment forms and check features. There are tons of changes waiting to be worked on and released. We'll be adding PayPal (regular, non-gateway) and Google Wallet integration as well. Our goal is to provide you and your guests as many ways of collecting payments as possible in as easy a way as possible. 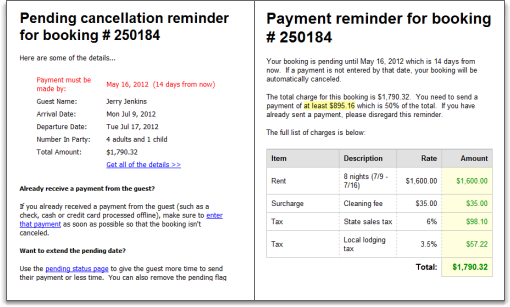 "If the guest sends a check payment but is a few days late, and you still want to book them, no need to worry. It's very simple. 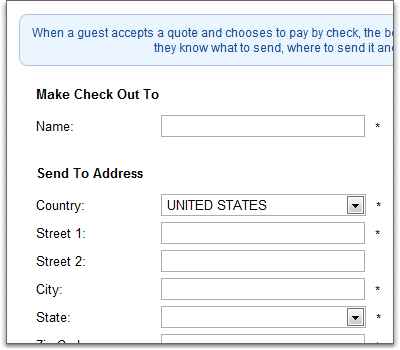 Either create a new booking and enter their payment manually, or send them a new quote to accept. If you send them a new quote, after they've accepted it, you'll enter their check payment at that point." This above statement concerns me, however. I would want to keep the original booking, with dates, and rental agreements and not inconvenience the guest to go through the process over again. 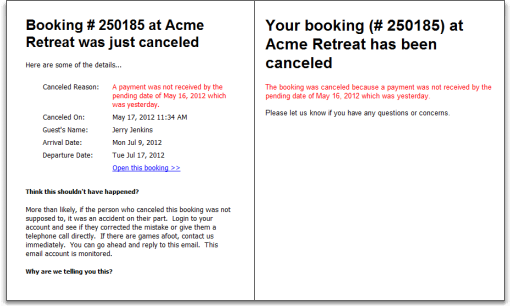 For the future, could the original booking be RE-OPENED (BOOKED) and then continue with recording the check? Or, perhaps the EXPIRATION date be changed on the booking, to re-open automatically? Not sure what would work, but you understand what I am trying to say? Ho do I cancel a scheduled payment? 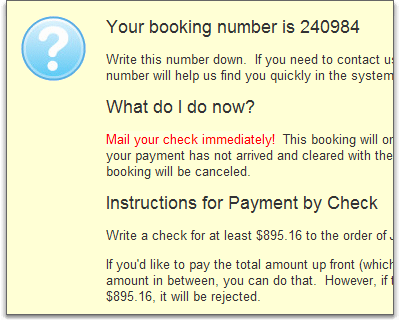 Go to the Transactions tab of the booking, find the scheduled payment and click on it in the list. Then you can delete it from there. These appear to be dated instructions. I am having a hard time finding where to increase the check acceptance date. Same here there is no place to change or even see the check acceptance date. what is check acceptance rate? I realize this thread is ancient, but one thing I learned as a landlord is that I don't accept checks. Besides bouncing, it is hard to prove that a check writer knowingly passed a bad check. There is multiple conditions that allow them to weasel out and make it not a crime. For my standard rental properties, I only accept money orders issued by the post office or Walmart. Certainly not for a bank I'm not familiar with; everyone has access to one or the other. Then if it is bad, it was fraudulent and illegal, and there is no way they can weasel out. Also, there is no waiting for a check to clear! I never had complaints from my customers about money order usage. Hey guys, sorry for the delay in responding. You set that on the property rules now, not the payment method (check method) itself. Each property can define when, or if, it accepts checks and how far before arrival. If you don't have an active check payment method, then those rules are ignored of course. They only matter if the check method is in place and used for that property. You can also tweak this on the quote or booking levels after they have been created. Check payment methods are absolutely alive and well. There are many use cases for offering it to guests. You can also apply a dynamic discount (eg. 1-2% type thing) if they select paying by check when booking. This can be a good incentive for pushing them away from CC and not paying your CC fees. For large/expensive properties, this can be a great thing to offer.